I started to build a list in the Internet Marketing niche a couple of years ago and have used the basic methods of capturing leads that is taught by main stream online marketers. I then decided to learn more about list building to grow my list faster, get a better conversion rate and monetize each subscriber better and it is how I learned that you can optimize your funnels for more profit. How to Optimize Your Funnels? If you are a webmaster or have been in Internet Marketing for a while, you certainly know how to optimize your website with SEO as it is common knowledge. That’s different when you have to optimize your funnels… only Ninja list builders know about this and in order to get the knowledge, well, you have to buy their eBooks or trainings. The first thing to do is to draw on paper a map for your funnels to see clearly how it will work. What you see below is a very basic funnel. First, you send traffic to a squeeze page. Second, the subscriber is added to your list after opting-in and redirected to a sales page. Fourth, the first email is received, it contains a link back to the sales page and the download. Sometimes the file is downloaded directly from the email and sometimes from a download page. Your opportunity to make money on the front and back end with this setting is limited. One method is to add Pay Per Lead programs in your funnel to bring you from $0.50 to $2.50 per subscriber. There are PPL programs for the Internet Marketing niche if you know where to look. You may apply to a few, five being a good number. 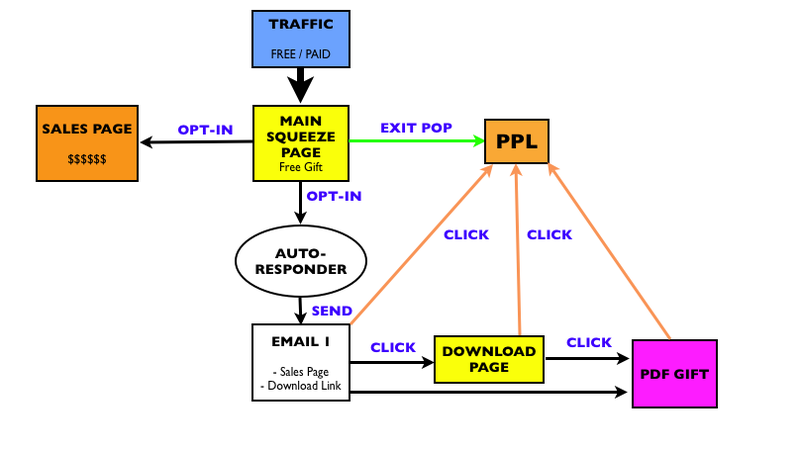 This is a map on how to optimize your funnels with PPL. As you can see, you have 4 chances per subscriber to get a lead and get paid for it when you optimize your funnels. The first way is to add an exit pop-up. The visitor is not interested in your offer and wants to quit your squeeze page, what about showing him anther one on exit and make some money? The second way is to place links to the PPL offer in your funnel. It can be done in your “First Email”, on the “Download Page” and in the “PDF gift” as well. In addition to this what you should do is put your PPL programs on a rotator, so if your subscriber clicks on the link in the Email, he will see the offer 1, when he clicks on the link on the Download page, he will see another offer, and so on. This is how you optimize your funnels for more profit.